German packaging equipment manufacturer Multivac is planning to demonstrate new chamber belt machine designed for packing food products in film pouches, at the upcoming Interpack 2017 event planned to take place in Germany. At the event, which is scheduled to be held from 4-10 May 2017, the B 325 machine will be demonstrated in conjunction with the new compact SE 320 shrink tank for producing shrink packs. The 1,000mm-wide B 325 machine is designed for the automated packing of large batches of processed meat and sausage, ham, bacon and fresh meat. The machine also allows customers to produce maturation and transportation packs for cheese blocks and catering cuts, including beef fillets and haunches. Additionally, the chamber of the machines is equipped with two plugin sealing bars, each 1,000mm long, at the front and back, enabling the machine to be loaded from both sides. At the event, Multivac will integrate the B 325 machine with its new SE 320 shrink tank unit. The new shrink tank unit, which can be used with machines from other manufacturers, can also be integrated with the company’s thermoforming packaging machines and small chamber belt machines such as the B 210 as well as with the B 325 and B 310. Multivac said that the shrink tank unit allows the conveyance of products that can weigh up to 80kg on an automatic infeed conveyor from the chamber belt machine or thermoforming packaging machine into the shrink tank, which contains 360l of water. Capable of offering optimized energy consumption, the 1.1m-long compact SE 320 shrink tank unit can be complemented with its TE 115 drying tunnel for drying the resulted products. 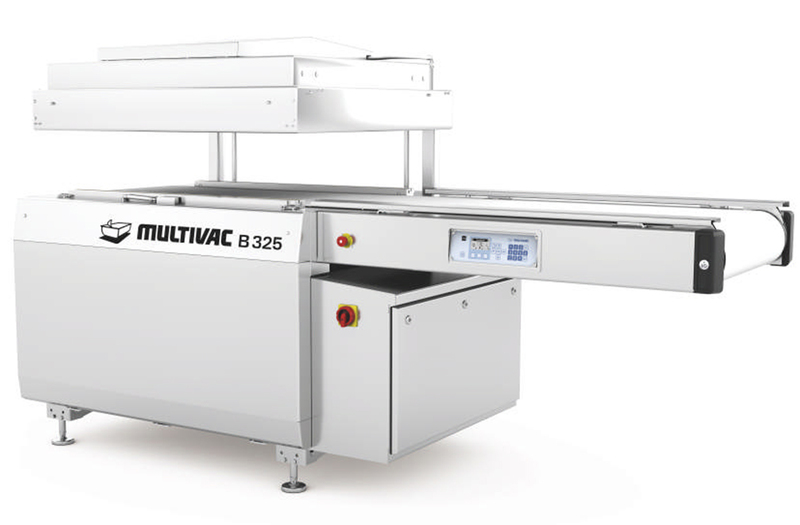 Image: Multivac’s B 325 chamber belt machine. Photo: courtesy of Multivac.